In the previous two posts (see here and here), I have discussed the concept of “primate city” and particularly how it applies to Russia, where two of the country’s largest cities, Moscow and Saint Petersburg, are traditionally considered its “twin primate cities” (see, for example, the Wikipedia article on primate cities). The two cities stand out politically, economically, demographically, and culturally with respect to other Russian cities and especially with respect to the much-depopulated and impoverished area between them. However, it is not clear to what extent Saint Petersburg is retaining (or will retain in the future, if present trends continue) its status of a twin primate city. In terms of historical and cultural significance, Saint Petersburg undoubtedly retains its standing: though no longer a global city, “a place to be”, which it was during the 18th and 19th centuries, Saint Petersburg, with its 165 museums and over a 100 theaters, is still a cultural powerhouse of Russia. 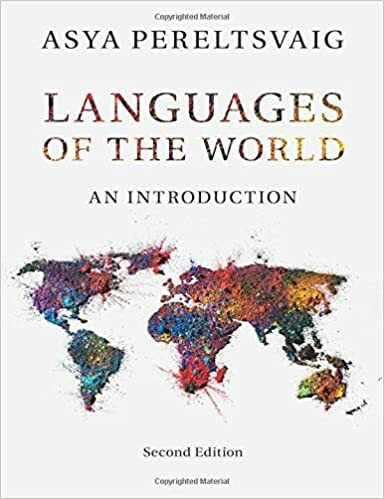 To some extent, it also retains its economic standing and political prominence (both Moscow and Saint Petersburg form their own federal subjects of the Russian Federation, apart from the corresponding Moscow and Leningrad regions). 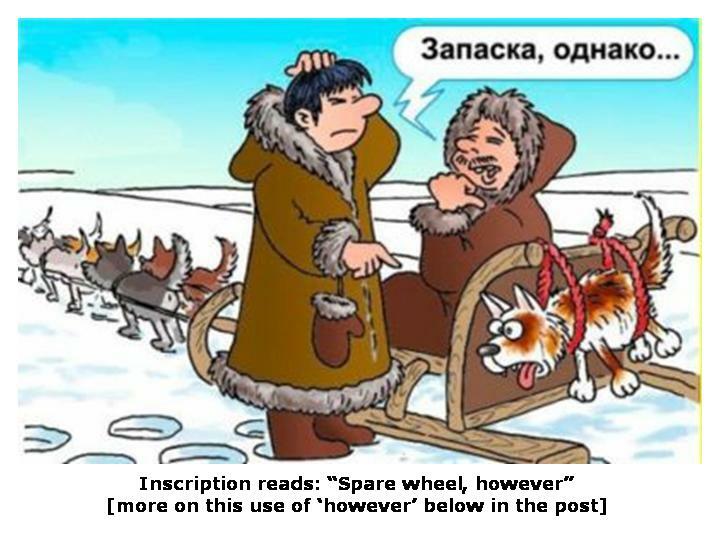 But demographic figures—the most easily quantifiable aspect of a “primate city”—no longer support treating Saint Petersburg as a twin primate city alongside Moscow. 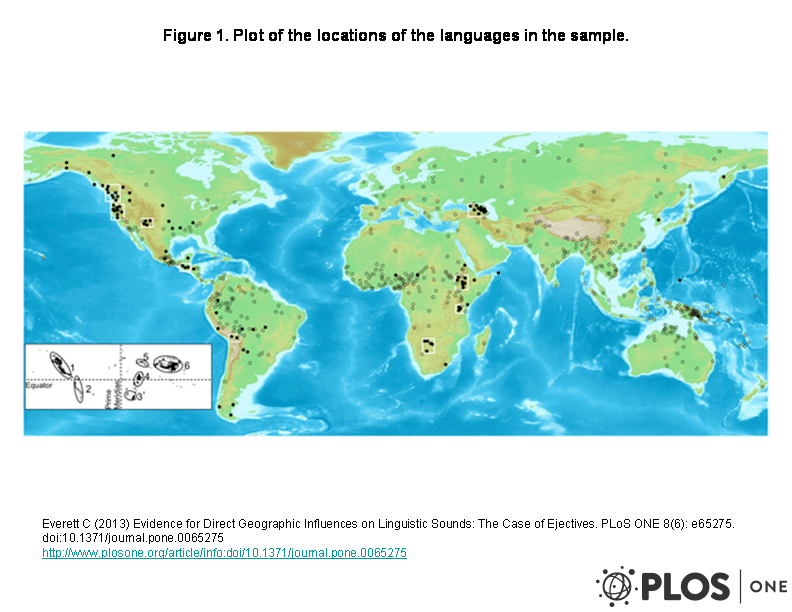 Demographically, a primate city is typically defined as “at least twice as populous as the second largest city in the country” (quoting from the Wiki article). In this sense, Moscow has recently become a true primate city, pushing Saint Petersburg into the category of “regular cities”. Moscow’s population, according to the 2010 population census stood at 11,643,060, whereas the corresponding figure for Saint Petersburg was 4,879,566—less than half of Moscow’s total. In 2015, the gap between the population figures of the two cities appears to be about the same: Moscow’s population is estimated at 12,197,596, whereas Saint Petersburg’s population is 5,191,690, about a million short of number that would allow it to count as a twin primate city. 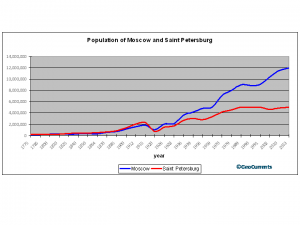 In historical terms, the demographic “tale of two cities” can be divided into three periods: the Tsarist period, when Saint Petersburg’s population was comparable to that of Moscow or slightly exceeded it; the Soviet period, when Moscow’s population exceeded that of Leningrad (as Saint Petersburg was then called) but generally not more than two-fold; and the post-Soviet period, in which, demographically speaking, Saint Petersburg lags too far behind Moscow to be considered a twin primate city. This overall picture resulted both from factors that affected the population of the two cities independently and from the political and economic rivalry between them. As can be seen from the Wiki chart on the left, the story of Moscow’s population size is pretty straightforward. In the 17th, 18th, and first half of the 19th centuries, it grew very slowly; more detailed data in the Wiki article shows a few instances of minor decline in the first half of the 18th centuries (when the newly established capital in Saint Petersburg attracted some of the Moscovites), during the 1812 War (when Moscow was ceded to the French and badly burned), as well as in 1856 and 1864. These fluctuations, however, are relatively insignificant, so one can speak of relatively stable population size at that time. In the second half of the 19th century, Moscow’s population starts growing more rapidly, passing one-million mark by the 1897 census (last pre-Revolutionary census) and reaching 1.854 million by 1917. 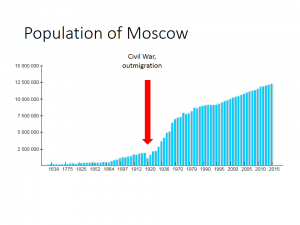 In the wake of the Bolshevik revolution and during Russia’s Civil War, Moscow experienced its most significant population crisis: by 1920 the population dropped to 1.028 million and it would return to the pre-Revolutionary level only in the mid-1920s. But as we shall see below, this crisis was a relatively mild one, compared to what happened in Saint Petersburg at the time. 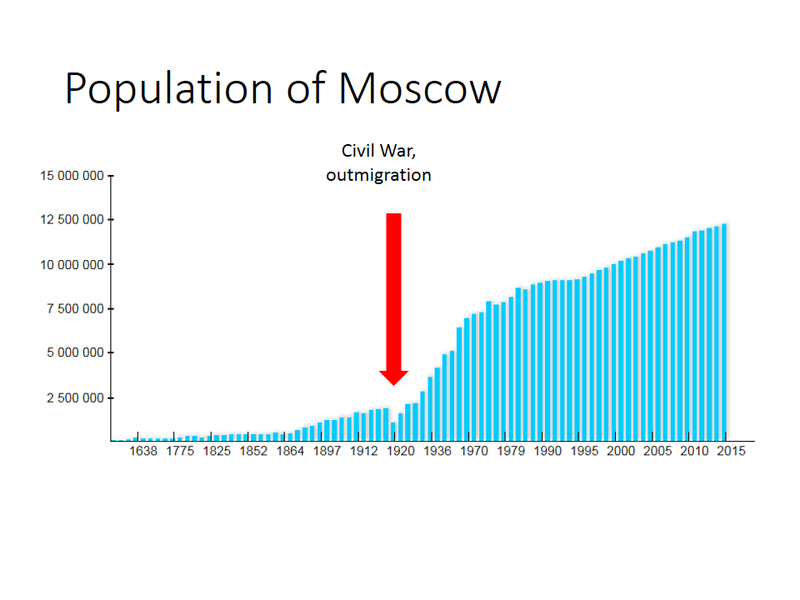 From then on, it has been a story of continuous and rapid population growth in Moscow (with only very minor declines in 1976, 1986, and 1993, which were “repaired” in a span of two-to-four years). Even during World War II, there was virtually no decline in Moscow’s population, which reached the 2-million mark by 1926, the 3‑million mark in the early 1930s, the 4‑million mark by 1939 (the last pre-WWII census), and the 5‑million mark by 1959 (the first post-WWII census). By 1972, the year I was born (in Leningrad! ), Moscow’s population crossed the 7-million mark, and in the post-Soviet period (since 1991) it grew from 9 million to 12 million. 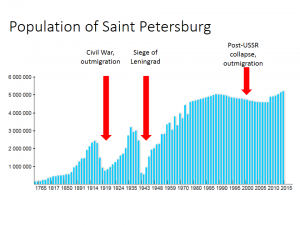 The history of Saint Petersburg/Leningrad population is considerably more complicated, with not one but three crises, two of them more substantial than Moscow has ever experienced. During the Tsarist period, Saint Petersburg experienced consistent population growth, unlike Moscow, which, as mentioned above, experienced a population decline in the first half of the 18th century, after it lost the capital city status to the newly minted “northern capital”. (Saint Petersburg served as the capital of the Russian Empire since 1712, less than a decade after it was founded, till 1918, with a brief gap from 1728 till 1732, when the capital temporarily returned to Moscow. 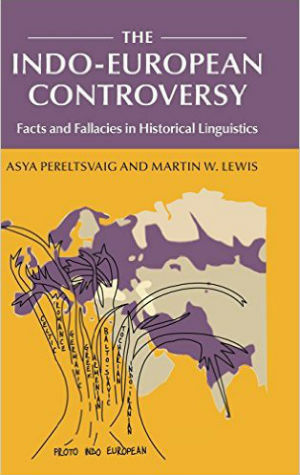 Curiously, for the first 9 years of its being a capital, until the Northern War with Sweden was concluded and the territory surrounding Saint Petersburg was legally ceded to the Russian Empire, the capital city was located outside the country’s territory.) However, in the wake of the 1917 Revolution Saint Petersburg (or Petrograd, as it was then called) experienced its first substantial drop in population. 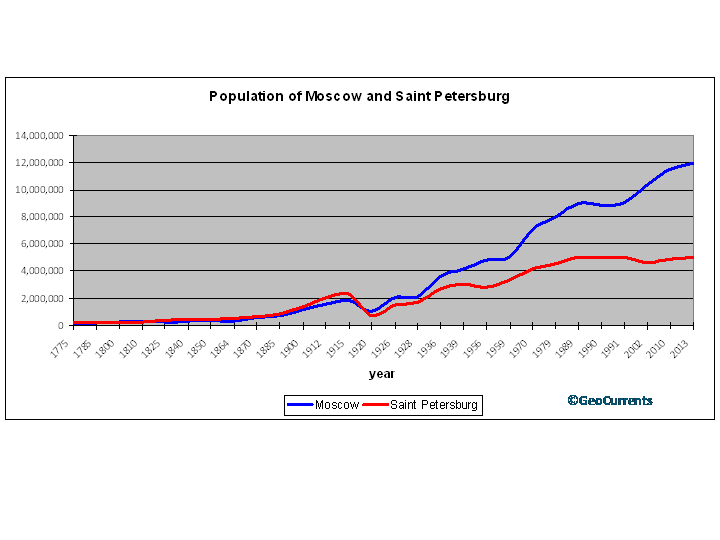 As can be seen from the charts above, this population crisis was far more significant in Saint Petersburg than in Moscow. One of the reasons behind this sharp depopulation trend is the deterioration in food supplies and living conditions in 1917-1919, which made many people escape to suburbs and rural areas, as well as abroad. Growth of violence in the wake of the October 1917 Revolution also made many residents flee the city. This outmigration was more severe in Saint Petersburg than in other large Russian cities (including Moscow) because in its years as the capital city, it developed larger professional and upper middle classes, who were particularly victimized by the early revolutionary decrees and the marauding “proletariat”. Moving the capital to Moscow in March 1918 also resulted in substantial migration from the old to the new capital. By 1920, only 740,000 residents remained in the former capital, compared to the 2.3 million in 1917. Although Saint Petersburg’s population stabilized and even grew back to the pre-Revolutionary levels in the 1920s and 1930s, surpassing the 3-million mark by 1939, the next depopulation crisis occurred only 2 years later, when the city lost over 1 million of its residents during the infamous 900‑day-long Siege of Leningrad. The highest mortality befell the city five months into the siege, in January 1942, when an especially bitter winter weather claimed the lives of 97,000 Leningraders. Only about 3% of the deaths are attributable to bombardments and artillery barrages, with an overwhelming majority of deaths due to cold and starvation: at the height of the siege, from November 1941 to February 1942, the only food available to a civilian was 125 grams of bread, adulterated with sawdust and other inedible admixtures, and distributed through ration cards. For about two weeks at the beginning of January 1942, even that food was available only for factory workers and military personnel. 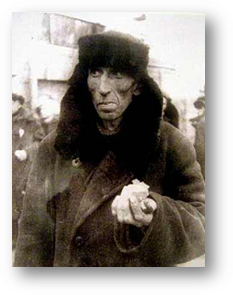 During 1941-1943, some 1.189 Leningraders were evacuated to the “Big Land” via the so-called “Road to Life”; despite its name, it became a “road to death” for tens of thousands of evacuees, truck drivers, Ladoga flotilla crews, and the accompanying medical personnel who fell victims to bombardments from the air and the treacherous ice of Lake Ladoga. (According to many memoirs, truck drivers drove with their cabin doors open in order to jump out if the truck fell through the ice.) By 1944, the city’s pre-War population of over 3 million dwindled down to just over half a million. The post-WWII recovery took a long time, with the city’s population reaching the pre-War level only in the late 1950s. In the subsequent three decades, the population growth continued but punctuated by brief drops in 1962, 1967, 1973, and 1976; in each case, the population figures recovered in the following couple of years. As a result, a 4-millionth Leningrader was born in 1975 and another one in 1977. This growth continued into the 1980s, and in 1988 the city celebrated the birth of its 5-millionth resident. However, the population growth in Leningrad was much slower than in the capital city of Moscow. As a result, the population gap between the two cities grew considerably during this period, and even more so in the wake of the fall of the Soviet Union in 1991. For nearly two decades after Leningrad, USSR turned into Saint Petersburg, Russia, it experienced continuous population decline. It was not as sharp as the two population crises in the first half of the 20th century, yet it continued for long enough to see a nearly 10% population decline, from 5,023,506 in 1989 to 4,568,047 in 2008. Last seven years have seen a gradual increase in Saint Petersburg’s population, which crossed the 5-million mark yet again in 2012. Yet, the distinct population trajectories for Moscow and Saint Petersburg mean that the gap between them continues to increase, making Moscow a true primate city, at least in the demographic sense.